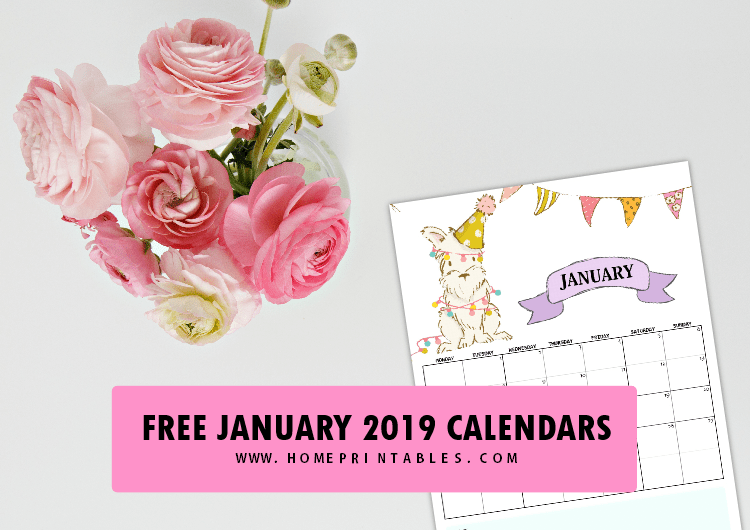 12 January 2019 Printable Calendar Planners: Super Fun Designs! We’re super thrilled to share our freshly designed January 2019 printable calendar planners! And yes, you can immediately print and use them today! Now is the perfect day to plan the first month of the year. Isn’t it that there’s nothing like starting the year with concrete goals? Join us in preparing for the brand new year! Ahhh, New Year! We just love the new hopes, dreams and possibilities it brings! Are you targeting to be more productive and organized come 2019? We here you! This is why, we’re releasing another set of January 2019 printable calendar planners on the blog right now. 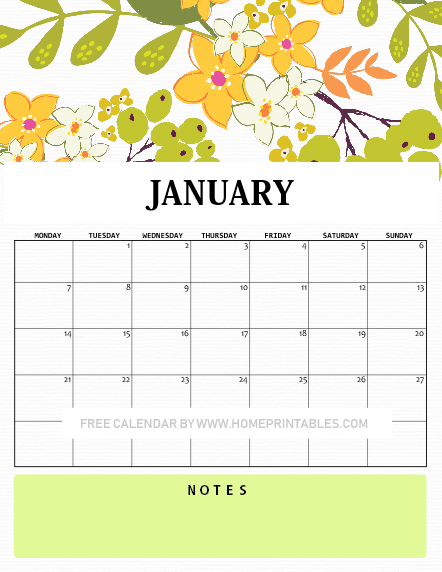 You can use these calendars to organize your schedule for the whole month of January. Dream big in 2019. Roll up your sleeves and start plotting out your action plans to achieve them. Here are the calendar planners that will help you do that! 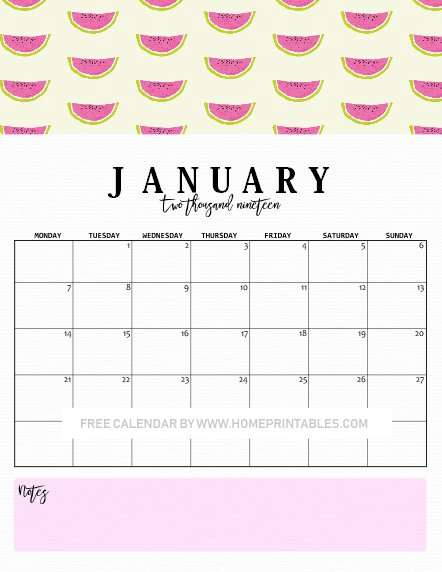 FREE JANUARY 2019 PRINTABLE CALENDAR PLANNERS TO HELP YOU START THE YEAR RIGHT! You are about to receive 12 printable January calendars from us today and yes they are ALL for free printing. A special shout out to Design Cuts and Creative Market where we got some of the graphic elements we used in designing your calendars. Let’s get started with this quick calendar preview! We’re starting this calendar roundup preview with this truly festive calendar design, perfect to use to welcome the brand new year! 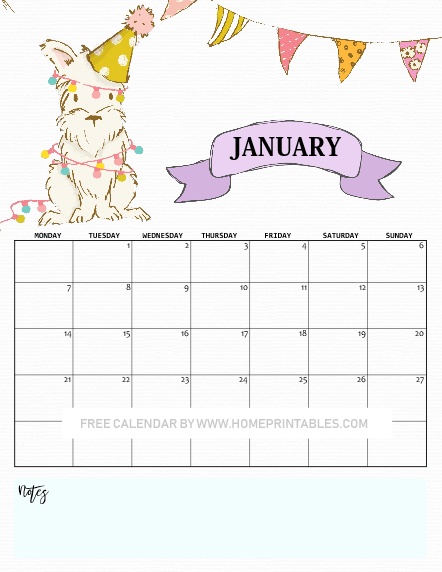 Set the year to the right mood with this cheerful calendar design! This is great to use as a planner insert and you can also print it for the kids in your life for their school binder! The second calendar design comes in super fun sea theme. This is especially created for the kids! Print this out for the little ones in your life and have them use it to organize their daily to-do’s. Also great to use as homework and project planner organizer! 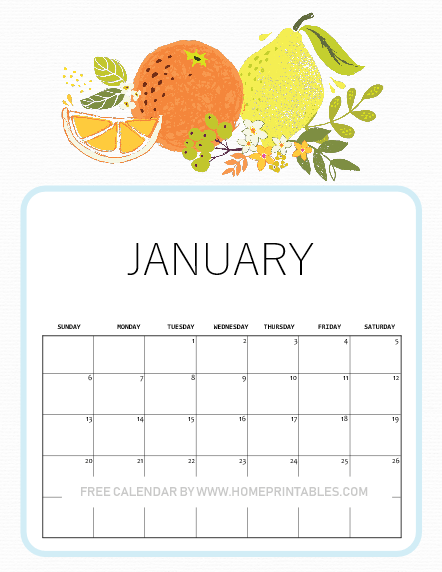 Looking for a calendar to use in your kitchen? This is a great calendar to stick onto your fridge’s door! Have this as your meal planner and you’ll be inspired to plan out healthier meals all through the month. We love this design dearly, I hope you do, too! 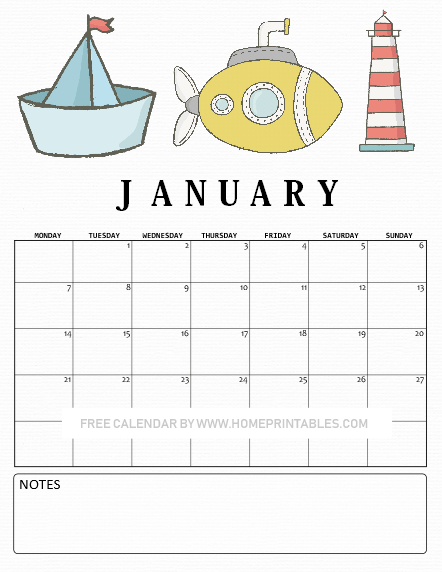 Next up is another cute patterned calendar that’s also great to use to organize you January plans. Where can use this one? What makes this design extra nice is that it has a room for your notes at the bottom of the page. Moving on, the next calendar that we have for you comes in cute floral theme. This will surely bring bliss to your monthly planning. The design is so refreshing! 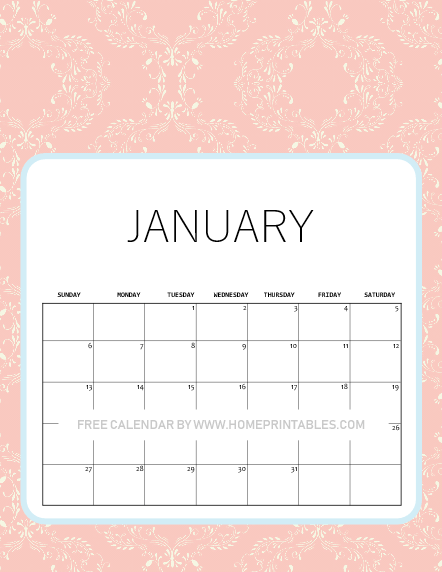 Anyone here who likes to use a pink calendar for January? Here’s a pretty one that you can snag and use for FREE! It comes pretty in pink. Here’s another summer-themed calendar that makes a great calendar to use in your kitchen. The watermelon looks sweet and cute! In need of a calendar with a huge room for your notes? 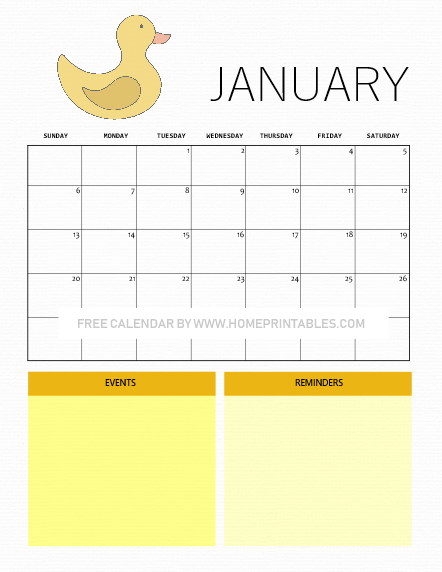 Here’s a super cute free printable that allows you to include your important events and reminders on a page. It’s super practical and functional. It’s great to use at home and workplace. Print yours! The last calendar that we have for you has a handpainted floral elements that’s so beautiful! It’s nice that this calendar design also has a room for your notes. Make sure to print this design from the free printable set that we’re sharing. 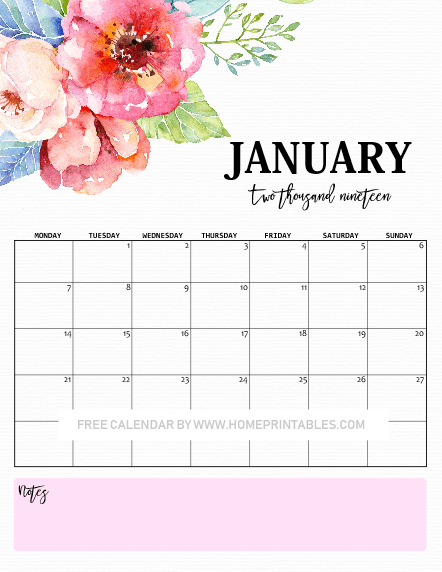 SNAG YOUR JANUARY 2019 PRINTABLE CALENDAR FOR FREE! That’s about it for our calendar tour. You’ll see more designs in your download because we have included 12 printable files for you. You can easily snag your free calendar. GO HERE TO DOWNLOAD THE CALENDARS INSTANTLY. And you’re all set to print them. They are designed for US standard letter size paper but they also look great when you print them on A4 sheets, just adjust your printer setting to fit the pages. 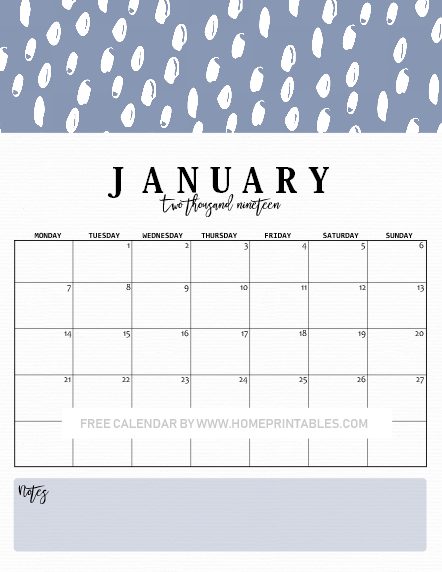 You can use these January 2019 printable calendar planners in many ways. Use them to as your meal planner, travel planner, goal-setting planner, academic calendar and more. What are your favorite ways to use monthly calendars. We hope you can share it with us at the Comments. Thank you for following along. We wish you all the best for 2019!